Child-friendly?Aliens in the Attic is a new film that appears to be geared toward fans of the television shows on the Disney and Nickelodeon channels. Ashley Tisdale from High School Musical and Austin Robert Butler from Zoey 101 both star in this family comedy about kids fighting off aliens who are trying to take over the world. The movie contains some action-packed scenes as well as some suggestive humor and language. The film is probably appropriate for children aged 7 and up. Instead of bugs and cockroaches in the home, imagine finding aliens hidden away in your summer home. Worse yet, some of them are angry and want to take over the world. That is essentially the plot behind the new film Aliens in the Attic, which stars Ashley Tisdale from Disney’s immensely popular High School Musical. Tisdale’s star is on the rise and looks to be the next young actress to blossom from Disney’s talent pool, so fathers should expect their tween children to be excited for this film. Tisdale plays Bethany Pearson who has traveled with her family to their vacation home in Michigan. However, the Pearson family soon discovers they are not alone in the house when Bethany’s younger sister Hannah (Ashley Boettcher) finds a friendly alien in the house with them. Though the alien doesn’t seem to mean the children any harm (there is a funny scene where the alien gets stuck in some of Hannah’s toys), there are other aliens nearby who aren’t quite as nice. This sets up a situation that pits the Pearson children (there are five of them in all) against the no-good aliens in an effort to save their house and, subsequently, the human race since it is later revealed that is the aliens’ plan to destroy the world. 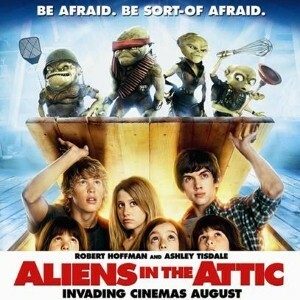 Aliens in the Attic is mainly geared to children, though parents should be aware that some younger children may get frightened about the idea of finding an unwanted creature in the family home, particularly in the bedroom.